Earlier on SLB, I ran an article (see link) on US power plant capacity factors, in which one of many oft-repeated false statements by nuclear proponents was discussed. Nuclear cheerleaders claim 100 percent capacity factor for nuclear plants, which is blatantly false. nuclear plant and got their brains fried, just a little....) said that I am quite wrong about nuclear plants being unable to follow the load, because naval ships from several countries have nuclear power plants that can be easily varied. "Of course a nuclear submarine or an aircraft carrier can have variable power output. And it is also true that the military nuclear power plants are not financially constrained as are land-based commercial electric power plants. The military Nimitz-class carriers presently have two reactors, each the small Westinghouse A4W design that have only 550 MWt output. For those not familiar with the terminology, that is 550 MW thermal, or heat output before any steam turbine splits the output into useful work and waste heat to a condenser. For comparison, a 1,100 MWe Westinghouse AP-1000 commercial nuclear power plant is approximately 6 times larger, at 3,400 MWt output. "You might wonder, then, why electric utilities don't just order up a few thousand of the A4W nuclear plants, hook them up to generators, and vary the output as they follow the load. Great question. The answer is, of course, that the tiny A4W plants are far too expensive due to reverse economy of scale. They produce at maximum 200 MW of electricity. Utilities would have paid a premium for load-following ability, then must spread out the huge capital costs over a small electricity sales volume due to not running in baseload mode. Their customers would scream in outrage when the electricity bills arrive. "Commercial nuclear plant operators realized early on that a 60 percent capacity factor was death to their industry. They had to run at much higher average output to have any hope of competing with natural gas or coal, and they had to forget about ever competing with hydroelectric. They were stunned when the Japanese built a pumped-storage hydroelectric power plant on the coast, using an artificial lake on the cliff and the ocean itself as the lower reservoir. That opens up the entire coastline world-wide, wherever a suitable elevation difference exists not too far from the shore, meaning only about 300 feet above sealevel. Now, all those natural-gas fired power plants that the baseload nuclear plants had forced to shut down or be throttled back each night could keep on running, pumping the seawater into the upper reservoir. "So, then you ask about curtailing windturbine operation and spilling from solar plants. Two responses to those. First, excess power to a grid drives the prices down. Why anyone that buys electricity sees this as a problem is certainly curious. The market forces take advantage of low prices, and suitable demands for power occur. Just one example is off-peak power at low price, sometimes zero or even negative price, that is used to chill water or freeze the water into ice for use the next day as building cooling. "Another use, as this article on a better battery discussed, is storage into a grid-scale battery for release later into the grid. "The second, and even better result of zero or negative power prices is that commercial nuclear power plants cannot compete, and elect to shut down. There are several nuclear plants in the US today that have this problem. FitzPatrick in New York has this problem, and Quad Cities nuclear plant could not win a bid to supply electricity to the grid. There are quite a few others that cannot compete and are screaming for government subsidy to keep the nuclear plants running. "So, there is one of the truths about nuclear power. Yes, they can follow the load with sufficient added costs, but they dare not in the US because they already cannot compete in the electricity market. Even running flat-out when they can, many of the older (and paid-for) plants cannot compete and sell their power. If they ran as load-following, their output must necessarily be less than maximum. That makes them even less competitive, and they know this." --- (end of response to the nuclear cheerleader). A more complete response (which would have created howls of indignation for "hogging the blog space") would include a few more facts. First, the US Navy also has a slightly larger nuclear reactor for some of its ships, the A1B that yields 600 MW output, combined electrical and shaft power to the propellers. It, too has the variable output that a military ship requires. But, it also has a huge cost and would be uneconomical in commercial electrical power service. The US Navy also is considering converting more of the fleet to nuclear power, and performed a cost-benefit analysis that was published by the CBO, the Congressional Budget Office. see link This link is to the 28-page report: The Cost-Effectiveness of Nuclear Power for Navy Surface Ships, May, 2011. One rather interesting conclusion is that building a ship with nuclear reactor power adds approximately $1 billion per ship. Note that the base case uses oil-fired propulsion to turn both the propeller shafts and generators for ship power. Here is a quote from the CBO report: "Each of the Navy’s current aircraft carriers (with the exception of U.S.S. Enterprise) uses two nuclear reactors of a design known as the A4W. The Navy’s newest aircraft carrier, U.S.S. Gerald R. Ford, will also use two reactors of a new design, designated the A1B. 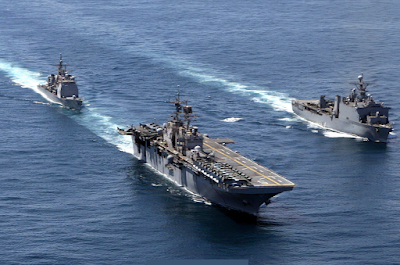 An LH(X) amphibious ship, which is slightly less than half the size of a nuclear-powered aircraft carrier, could accommodate one of the A1B reactors to be used in the Gerald R. Ford. However, outfitting a destroyer or an LSD(X) amphibious ship with an A1B-sized reactor would require a significant increase in the size of those ships to accommodate the reactor and its cooling and other support systems. Nor could those ships be outfitted with the nuclear reactors that the Navy currently installs in its Virginia class submarines, because those reactors would be too small to adequately power a destroyer or an LSD(X). CBO assumed that the Navy would instead design a new reactor for its destroyers and LSD(X) ships." -- footnote 7 from CBO report. And another quote, noting that nuclear propulsion adds approximately $1 billion to the cost of each ship: "In CBO’s estimation, the acquisition-cost premium for a nuclear versus a conventional ship would average about $1 billion per hull, but it would vary by the class of ship. The initial fuel core for a modern reactor lasts for the life of the ship, and the U.S. government already owns enough nuclear material to supply all of the ships considered in this analysis. Moreover, unlike the case with aircraft carriers, which the Navy expects to serve in the fleet for 50 years, the ships that CBO considered would require no additional outlays for midlife refueling. Thus, CBO estimated that the acquisition-cost premium for a nuclear ship would be about $1.1 billion per destroyer, $0.8 billion per LSD(X), and $0.9 billion per LH(X). . ." -- p. 18 from CBO report. Yet another interesting conclusion in the CBO report is the relative cost-effectiveness of nuclear vs oil-powered ships. The destroyer class ships represents 70 percent of the new ships over the period in question, (39 destroyers of 56 total), and the price of oil for which nuclear-powered destroyers breaks even is $223 per barrel, in 2011 dollars. That must be increased by any inflation over the years, so approximately $260 in 2016 dollars. Compared to today's oil price of approximately $40 per barrel, and no prospects of oil prices increasing in the next few decades, the future of nuclear-powered navy ships appears dim. In conclusion, yes a nuclear power plant can be designed to vary its output. Navy ships do this, and no one can dispute that. But, commercial power production is entirely different. Economy of scale dictates much larger power plants for land-based commercial power, and costs to construct are in the $10,000 per kW range. To have any chance of selling their power at attractive prices, nuclear power plants run as baseload. If nuclear plants run as load-following, their output must decline and they either lose money, or increase the price of their power sold. In the US, with natural gas, wind, and solar as their competition, nuclear plants cannot hope to compete as load-followers. They are having difficulty competing as it is, with baseload operation.